It was with visions of roast chicken, turkey stuffing and sausage gravy that I harvested sage this past Sunday. It was to be the final harvest of the year for my square foot garden. Sage seedlings being hardened off. I cut all the branches of this sturdy shrub and brought them into the house for preservation. The sage plant proved to be quite frost tolerant surviving many hard frosts including a few nights with lows in the upper 20s Fahrenheit. When the forecast called for the possibility of snow on Sunday night, I knew it was time for the final harvest. This was my first year growing the herb. The plant was very vigorous. 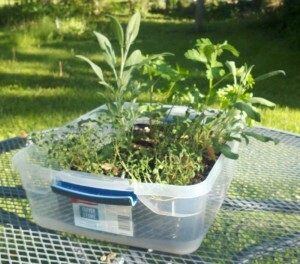 The two sage plants started from seed grew to heavily shade the thyme in an adjacent square. These fresh sage leaves will be used for a tincture. To preserve sage, it can be dried or frozen. 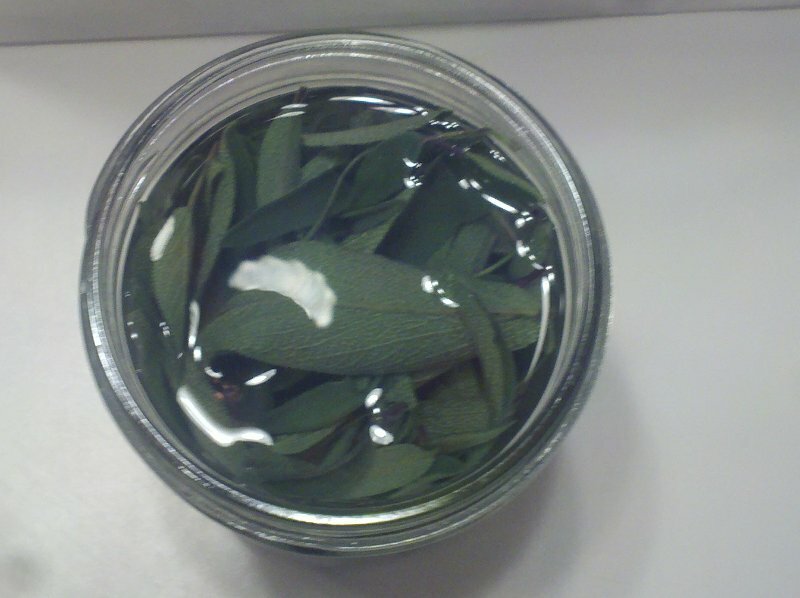 Sage can also be preserved in vinegar, infused in oil or made into savory sage butter. All of these techniques and more are covered in this comprehensive page about preserving the sage harvest. The preservation methods that I am using are drying, freezing and the two methods discussed below. I am drying the majority of the sage harvest by hanging it upside on a storage shelf. This shelf is in close proximity to a window and a cast iron radiator. The radiant heat should help to dry the herbs. The leaves need to dry until the leaves are brittle. Based on my reading this should take about two weeks. 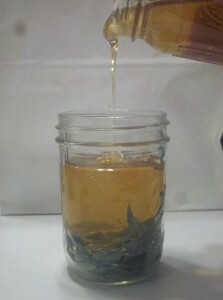 After reading the original article on sage preservation, I was inspired to make sage infused honey. I am always looking for new ways to use and enjoy this wonderful golden sweetener. I am looking forward to using this infusion in hot tea to bring relief to sore throats this winter. Before preparing the honey sage infusion, I did some more research and found two articles especially useful. The first article recommends filling an empty jar half way with the herb. The second article is more in line with my views on how to treat honey as it doesn’t recommend heating the honey or exposing it to sun light. In fact, it recommends waiting 4-6 weeks and says there is no problem leaving the sage in the honey. Soaking sage in alcohol to produce a tincture. 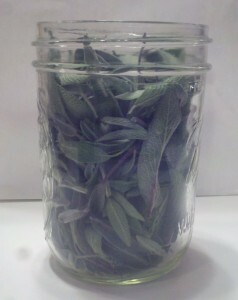 A portion of the sage harvest was also dedicated to creating a tincture. This tincture is made with pure alcohol. It will serve as an ingredient in home made deodorant. 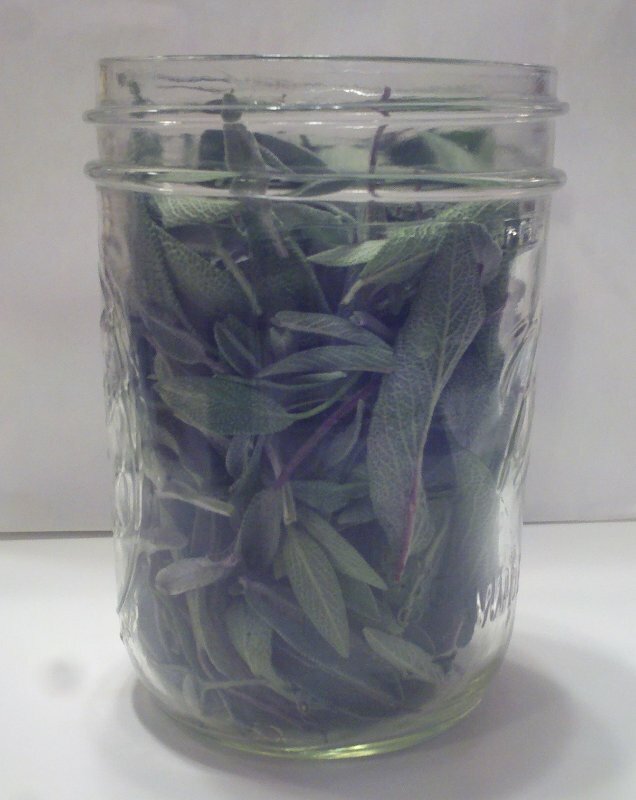 Comprehensive page about preserving sage. How to make sage infused honey. Do you grow sage in your garden? How Many Beans Per Square Foot? How Tall Is A Mongolian Giant Sunflower?